Lift-assisted, alpine skiing has very specific fitness demands. The first is eccentric leg strength. When alpine skiing, gravity “bounces” you down the hill. From a strength perspective, your legs first fight gravity from being forced into the mountain, and then pop up, out of the hole, into the next turn. Early in my coaching career I learned the hard way we can’t train eccentric leg strength with exercises like front squats and back squats. These train primarily “concentric” strength – the strength it takes to press out of the bottom of the squat. This plan uses our “Quadzilla Complex” to train your eccentric leg strength. The Quadzilla Complex is a more intense complex of lunges, jumping lunges and squat jumps – where I use loading – dumbbells – to maximize it’s effectiveness. There is a lot of loaded hopping and jumping in Quadzillas, causing the athlete to land under the force of loaded gravity, and rapidly slow their deceleration. In this way we train eccentric leg strength. You’ll complete Quadzillas on Mondays and Thursdays in this plan and as you work through, the volume increases. Beware …. eccentric leg strength training is intense and you’ll likely be quite sore. We give you Wednesday’s off in this plan to help with recovery. The second specific fitness demand of alpine skiing is what I call “Leg Lactate Tolerance” – the “burn” you feel in your quads at the end of a long ski run or at the end of a full ski day. This training plan deploys Touch/Jump/Touch Intervals on Tuesdays and Fridays to train your mind and body for this demand. Over the course of the plan, we increase the overall number of the intervals you complete, as well as increase the work interval and decrease the rest. Third, alpine skiing demands solid rotational, anti-rotational and extension core strength. This plan trains these also. On Monday’s and Thursdays, you’ll perform Scotty Bobs – an upper body strength exercise which has a solid rotational core component, and on Tuesdays and Fridays, you’ll perform a focused core circuit between sets of Touch/Jump/Touch intervals. The training sessions include a warm up, and are designed to be completed in 30 minutes. Work briskly, but not frantically through each day’s training. Progression and focus are key to the design. Over the 4 weeks in this plan, we “progress” the volume of the Quadzilla Complex and Touch/Jump/Touch intervals you complete. Same thing, only harder. 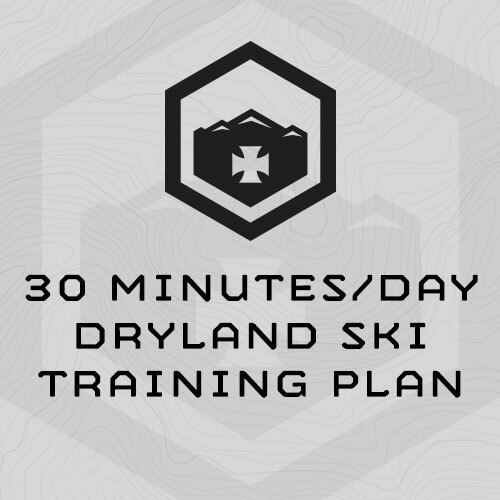 This training program is specifically designed to be completed the 4 weeks directly before your ski season or ski vacation begins. Overall, this training is efficiently designed to get you to the slopes sport-specifically fit, strong and stable – so you can get the most out of your turns at the beginning of the season, or enjoy your ski vacation to the fullest. "Just have to say, I started to dread Quadzilla complexes as I progressed in the Dryland Ski training, but holy shiitakes! I have never felt so strong on the mountain! You really helped elevate my skiing experience and I’ve been telling everyone I know who enjoys skiing about this program. Now I embrace the Quadzillas! My husband has been using your programs for years and finally convinced me last year to start. Not going to lie, I was intimidated at first even with some CrossFit experience, but I’m so glad I started because I haven’t been able to experience such improvement in strength and endurance that carries over so well in my every day life and outdoor adventures. He’s happy too, since it’s a rare occasion when I admit he’s right. ;) Thanks again for your awesome customer service, recommendations and all the work you guys do!!"